Contributes to cell metabolism, muscle contraction, cardiac function and vasodilation. Inotropic, dromotropic and chronotropic effects on the heart. Used for restoring energy or for supporting physical performance. PEAK ATP™ is a new-generation nutraceutical which provides the body with the exact molecule it needs to produce energy (adenosine triphosphate or ATP), in the form and at the dose which research has shown to be effective. ATP is a major human metabolite which plays a crucial role - both at an intracellular level (energy-producing) and an extracellular level (regulating numerous physiological functions). ¤ ATP levels decrease inexorably with age (by around 50% between the ages of 20 and 70) - many older people complain of having less energy than when they were young. Adequate levels of ATP are essential for well-being, physical exertion and even for certain organs to function properly. Decreases in blood and plasma ATP pools, in particular, have a detrimental effect on blood pressure and vascular health. ¤ PEAK ATP™ is the first nutraceutical to enable ATP levels in the body to increase without having to consume more food. Dr Rapaport, of Harvard and Boston Universities' Medical Schools, is an authority on the subject of ATP - he has studied it for 30 years, publishing over 50 scientific studies on its role in the body. PEAK ATP™ is produced under exclusive licence of the 10 patents he holds in relation to its use as a nutritional supplement. ¤ PEAK ATP™ has been shown to increase levels of ATP in red blood cells, plasma and organs, as effectively as injections. Such increases activate ATP receptors on vascular walls which relax and dilate them, enabling more blood to reach the heart, lungs and periphery, without increasing heart rate or blood pressure. These increases in ATP levels remain measurable for at least six hours. To improve physical and athletic performance: PEAK ATP™ increases the availability of glucose, nutrients and oxygen in muscles. This allows faster removal of catabolic waste products which, in turn, improves both performance and recuperation while reducing the perception of fatigue and/or exercise-associated pain. ATP does not, however, appear on the list of banned substances. For anti-ageing: by restoring youthful ATP levels, PEAK ATP™ improves circulation in general and in a non-stimulating way. PEAK ATP™ benefits the pulmonary and cardiovascular systems first, and subsequently all peripheral systems. 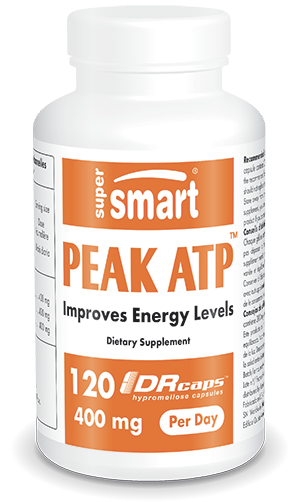 By improving circulation to, and within the brain, PEAK ATP™ improves cerebral metabolism and mental acuity. A recent study also shows that oral administration of ATP significantly reduces pain associated with lumbar arthritis. PEAK ATP™ is produced by a proprietary fermentation process which conforms to GMP and ISO 9002 standards. As ATP is degraded by stomach acids, this product comes in gastro-resistant tablets designed to release the active principles exactly where they can be absorbed. Alongside this innovative formulation, other dietary supplements may also be of interest for maintaining general well-being. Our supplement Suntheanine®, for example, provides L-theanine, an amino acid with anti-stress effects. Another multi-beneficial amino acid is L-phenylalanine, while our formulation Natural Thyro Formula can help maintain balanced and healthy thyroid function. Peak ATP™ is an ingredient patented by TSI Health Systems, Inc (TSI). Each DR caps contains 400 mg Adenosine 5’- triphosphate (96% ATP disodium).